Caithness school girl chops overly excitable ladies finger off! NEWS-FLASH - Coudroy Pillows are making headlines! Or hows about - after a late night of catching up on desperate housewives, little tommy (stood in front of mr hussain - yawning) has trouble keeping awake and looking interested - and knowing he has to go back to school and draw a picture of the nice new tesco -And probably write a story about how he found a magical portal to an extra dimension just under the tinned tuna! Dearie me I have been working near primary school teachers too long! "Some people will do anything for the chance of a free bottle, but Saddam's just wondering if they stock razors"
Good doc Szin what have you started? Lord Lou Cann, MP for Greater Caithness, defied the county-wide ban on ventriloquism with a cunning Middle Eastern disguise and an extremely lifelike doll. Barbie's blonde curls and realistic facial makeup fooled all but the most suspicious onlookers. 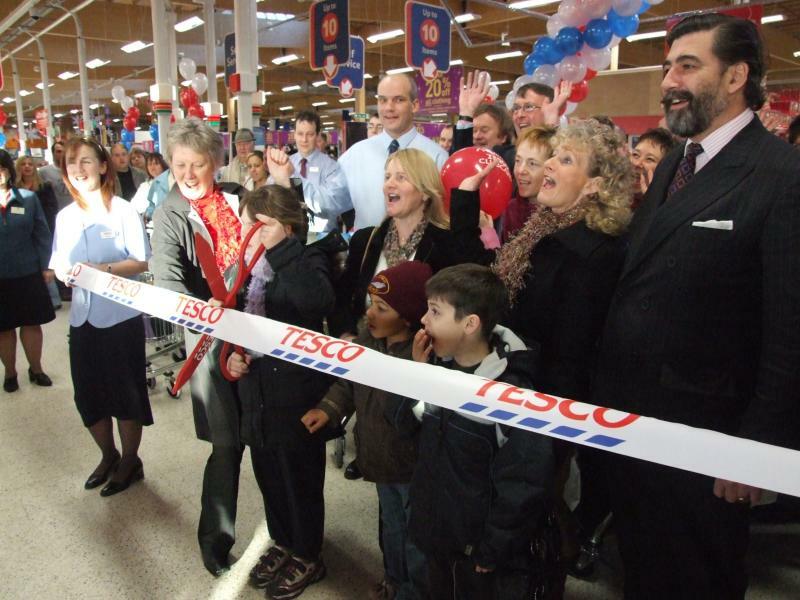 Tesco manager, Mr S M Art, 39 1/2, (pictured at back) told the Org's roving reporter, "I knew I'd seen that beard before, and the doll's bubbly personality seemed too good to be true - she made more noise than all the anti-Tesco protesters put together. I gave them each a bottle of champagne as a token of my appreciation." Last edited by Sporran; 29-Nov-06 at 07:32. I am living for today, always remembering yesterday, and looking forward to tomorrow! Lord Thursa "Jings, I only came in for a pint of milk and a tin o beans!!" Whot ees dees place dey call Tescos? I tot for une moment I was een France wit all dees bleu blanc rouge balloons! Blonde to the left of Thurso "Did ye fart john?" Blonde "Well it blew me away!" wee boy " whats at smell?" rrrrrrrrright if I listen for the scissor snip, knock down the sleepy lad and race for a trolley, I can grab all the Jaffa cakes and be first through the checkout, all in less than a minute!